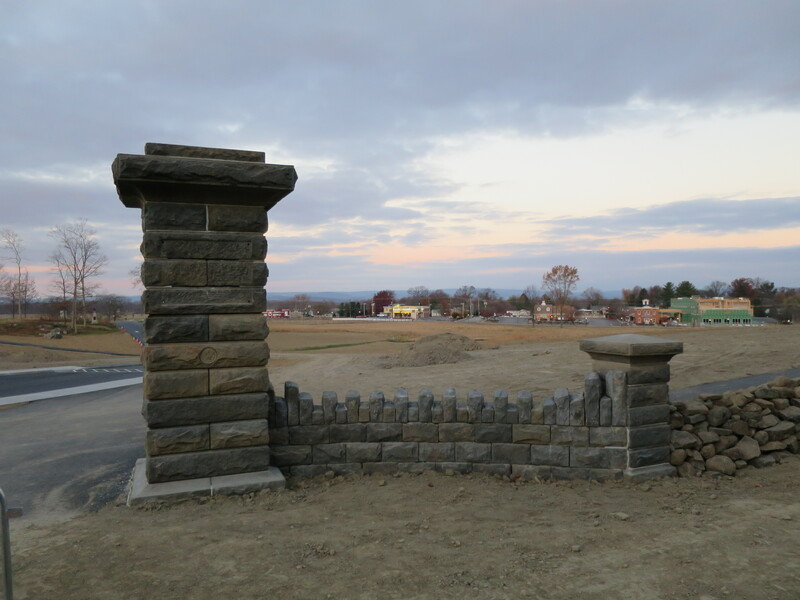 The Hancock Avenue Gate, which is being constructed by the National Park Service, is an object from Gettysburg National Park’s “commemorative period.” Today we will review how we physically got to this point by reviewing the progress from July to November, 2016.This image was taken facing southwest at approximately 7:30 AM on Sunday, November 27, 2016. Originally Hancock Avenue had a wooden gate at its entrance along the Taneytown Road. 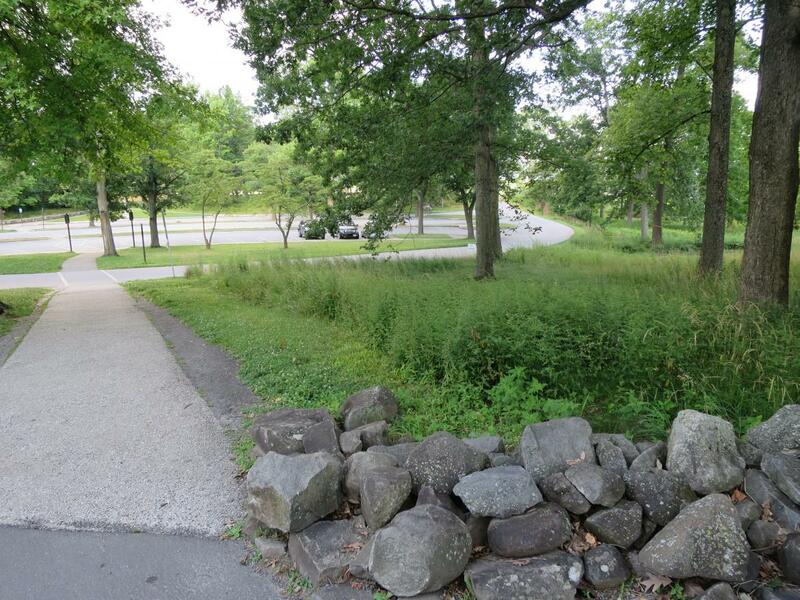 The National Park Service has decided not to put back this gate. Notice the “commemorative era” stone walls in the background.This image was taken facing southwest circa the late 1880s. The next Hancock Avenue entrance was flanked by the fencing from Lafayette Square in Washington, D.C. 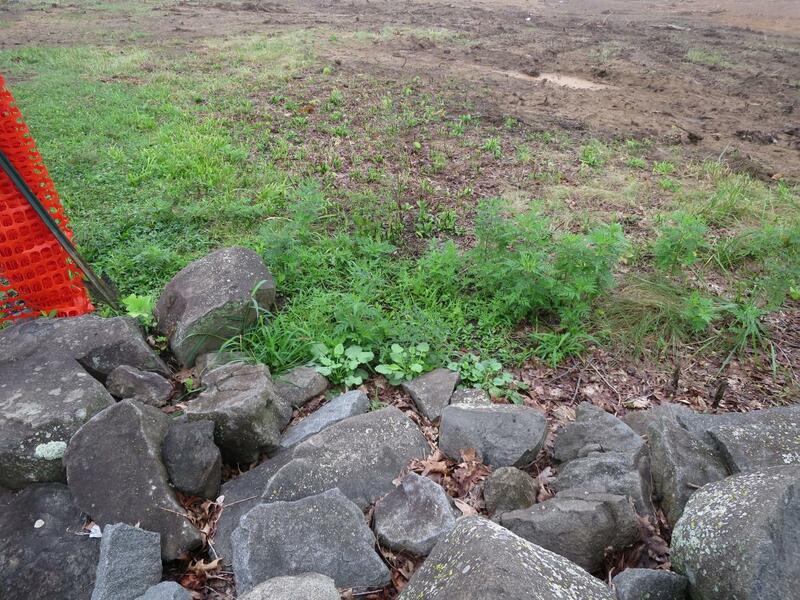 The National Park Service is not reconstructing this metal fencing. 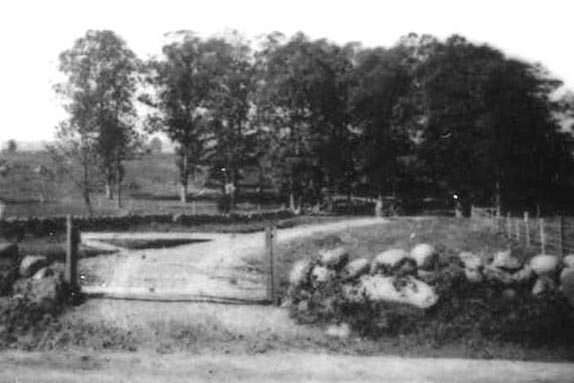 Notice the stone wall had now fallen/been reconstructed to its more appropriate 1863/battlefield appearance.This image was taken facing southwest in 1896. 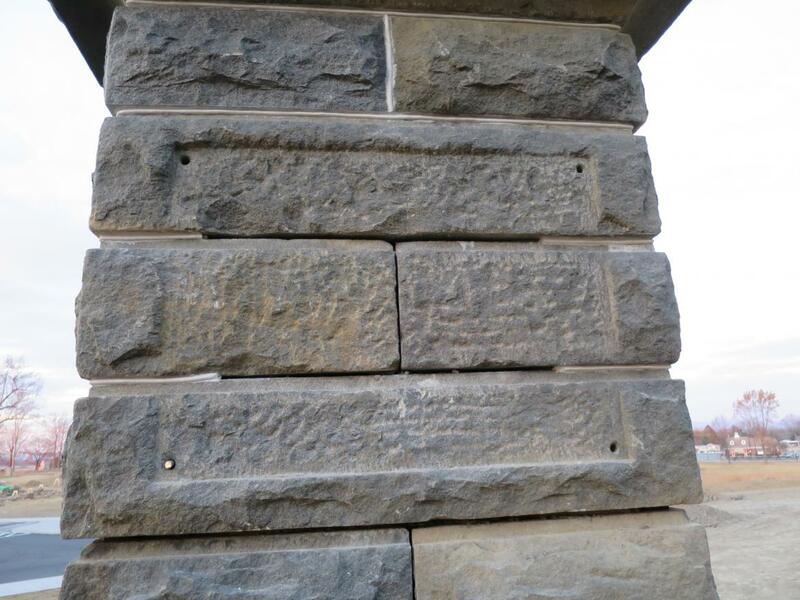 Here is the stone gate that the War Department put up in 1923. 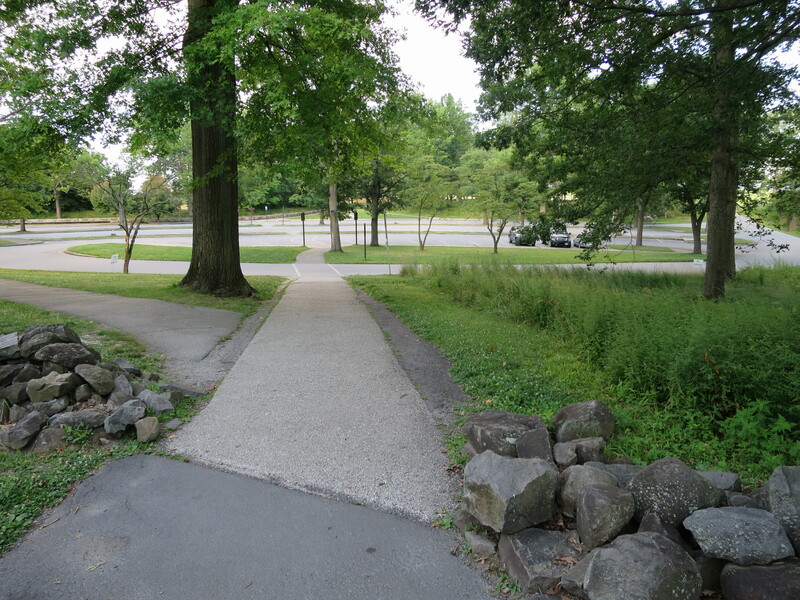 It was removed circa 1960 when the National Park Service constructed the Cyclorama parking lot, and moved the entrance to the parking lot farther to the left or south in this view. 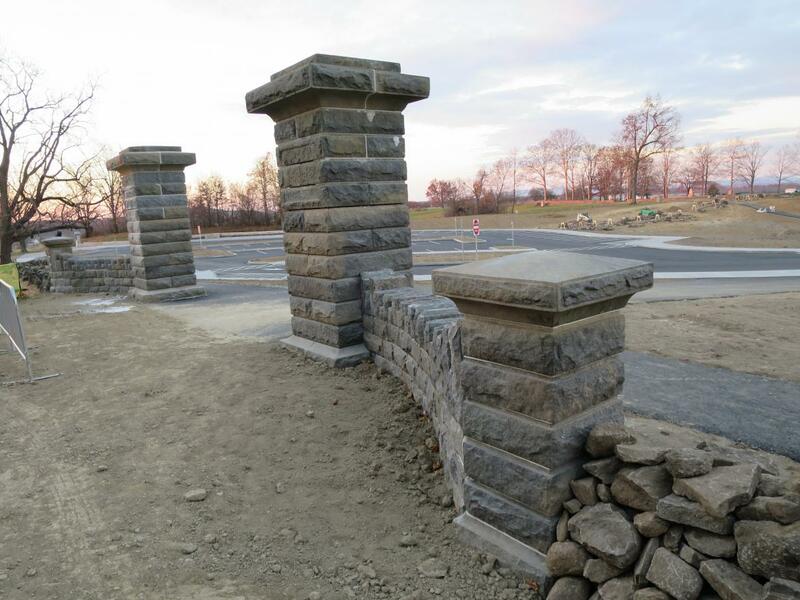 The National Park Service is putting back a gate that will look like this one, and which will contain some of the same stones. 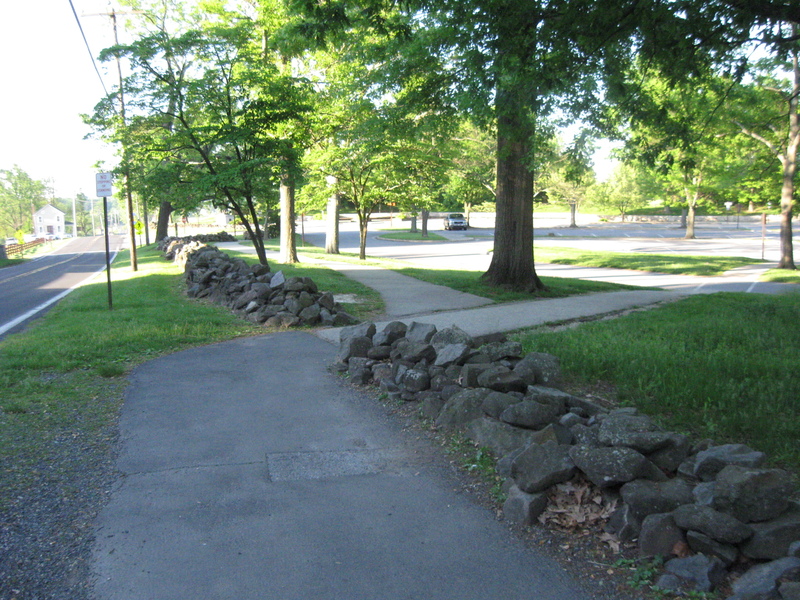 The stone wall in the background is the type of “commemorative era” stone walls that are again being placed in this area.This view was taken facing southwest after 1923 and before 1960. 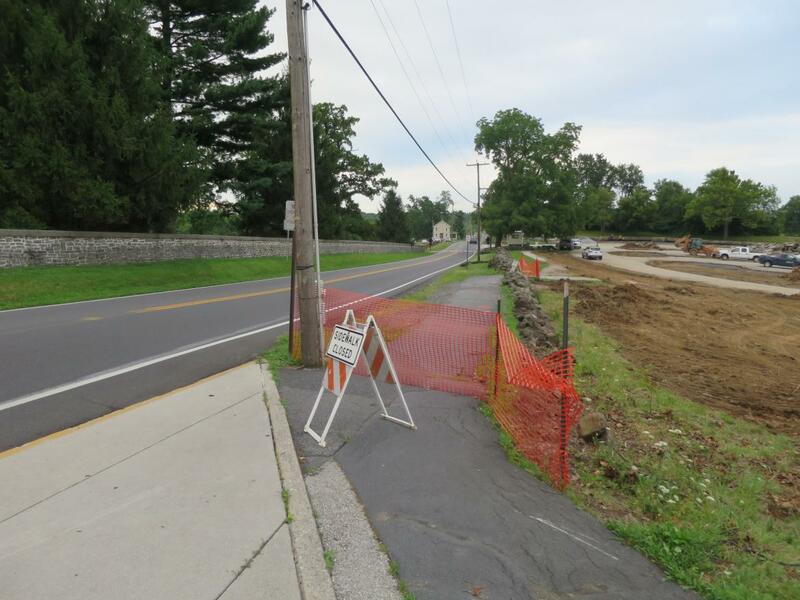 We’ll walk down the new asphalt sidewalk towards the gate. 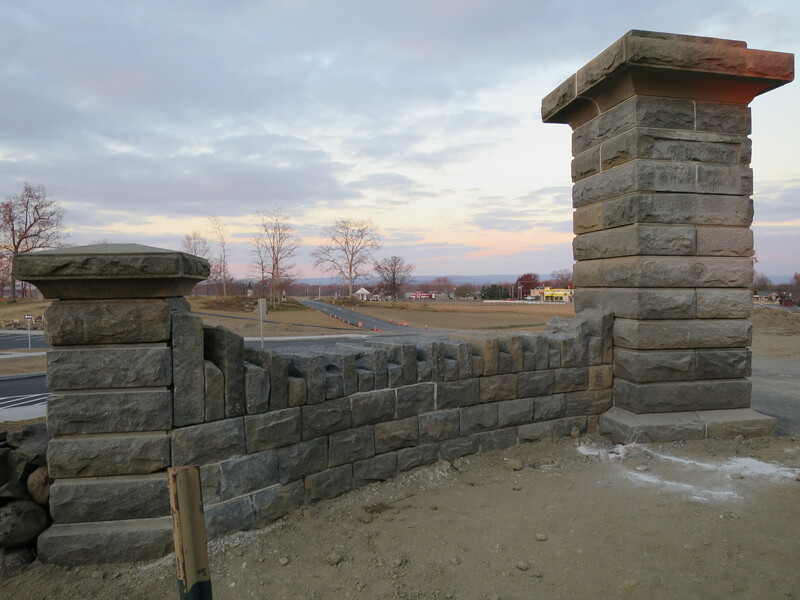 The stone wall is a hybrid of the 1863/battlefield stone wall and the “commemorative era” stone walls that are being reconstructed in this area.This image was taken facing south at approximately 7:15 AM on Sunday, November 27, 2016. 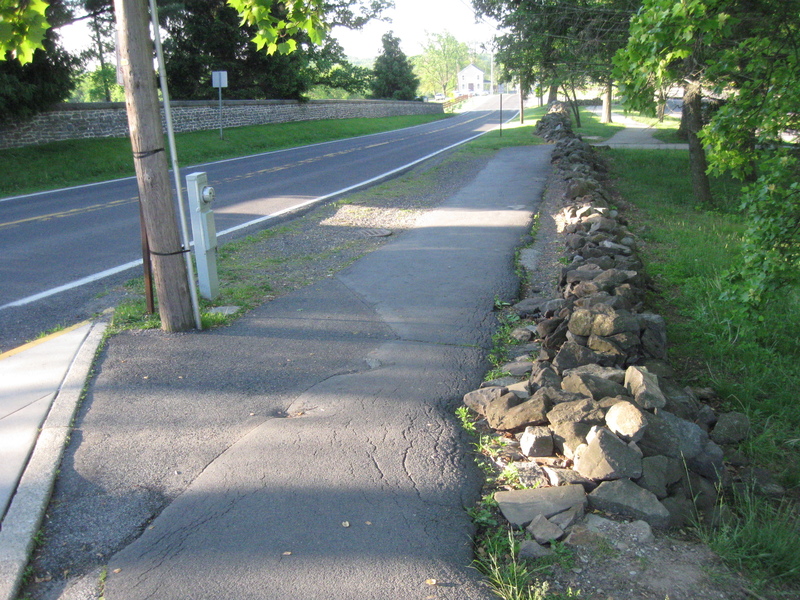 Here’s approximately the same view as in the preceding photograph showing the old aslphalt sidewalk along the Taneytown Road. 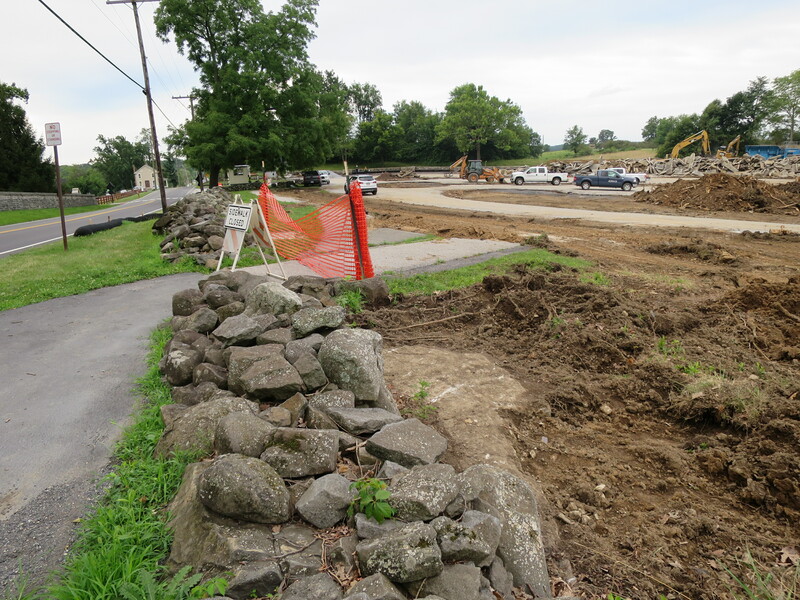 The new “commemorative era” stone wall has now been placed where this asphalt sidewalk was once located. 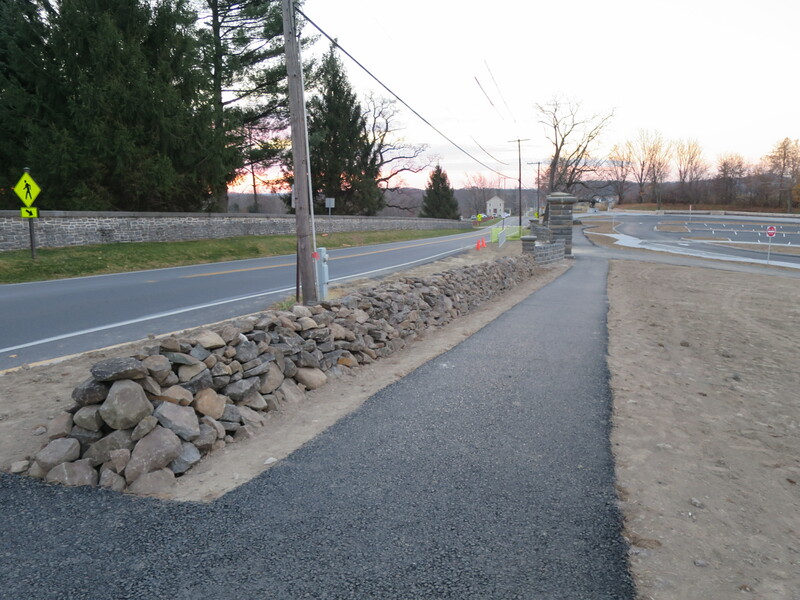 The 1863/battlefield style stone wall has now been completely removed and the new asphalt path is approximately at its location.This image was taken facing south at approximately 7:00 AM on Monday, May 26, 2014. 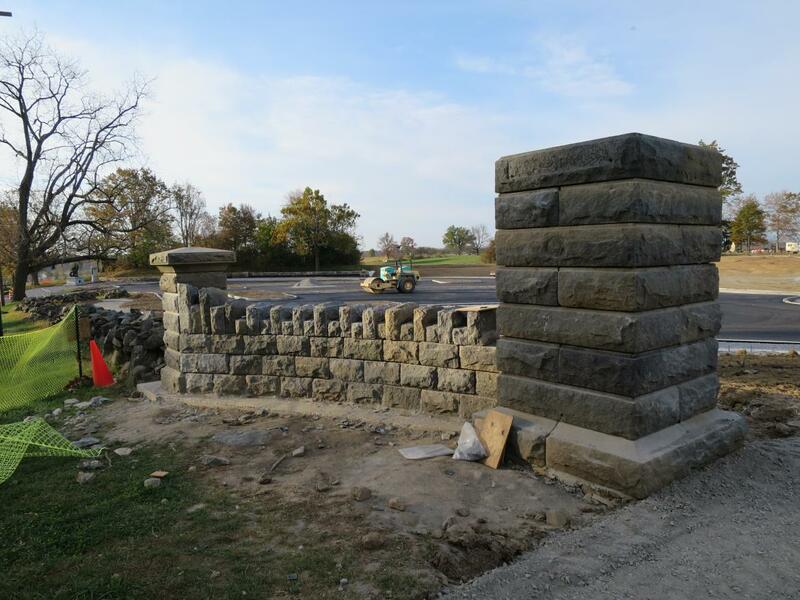 The Hancock Avenue Entrance Gate as it looked last month.This image was taken facing southwest at approximately 7:15 AM on Sunday, November 27, 2016. An earlier view of the same area as the preceding photograph. 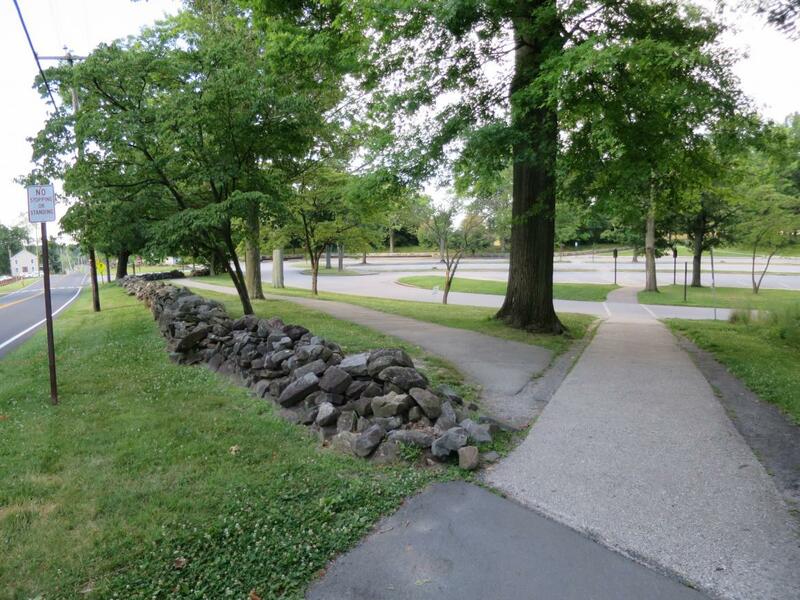 The sidewalk which goes between the stone wall is the location of the open area between the two columns of the “commemorative era” gate.This image was taken facing south/southwest at approximately 7:00 AM on Monday, May 26, 2014. 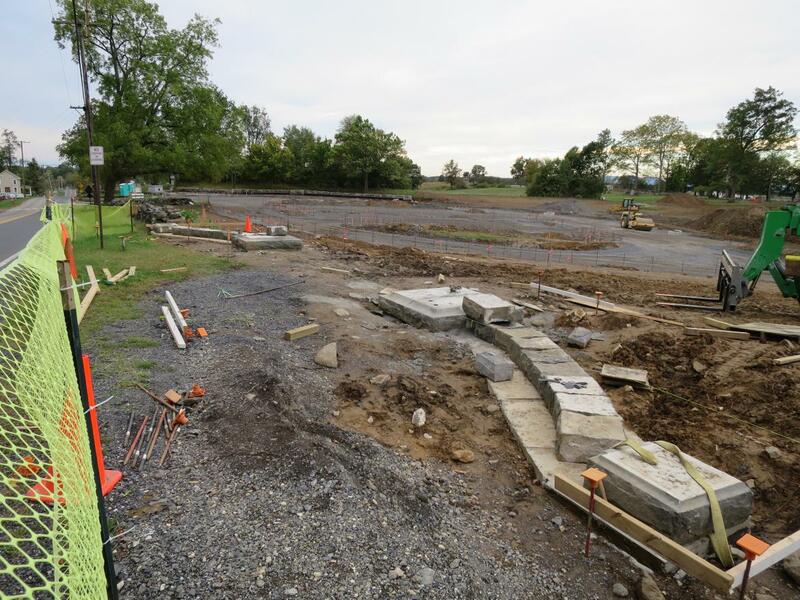 As stated in previous posts, we do not support the construction of “commemorative era” features that commemorate nothing to do with the Campaign and Battle of Gettysburg and the dedication of the Soldiers National Cemetery in 1863. You know, the reason that the National Military Park was created in the first place. 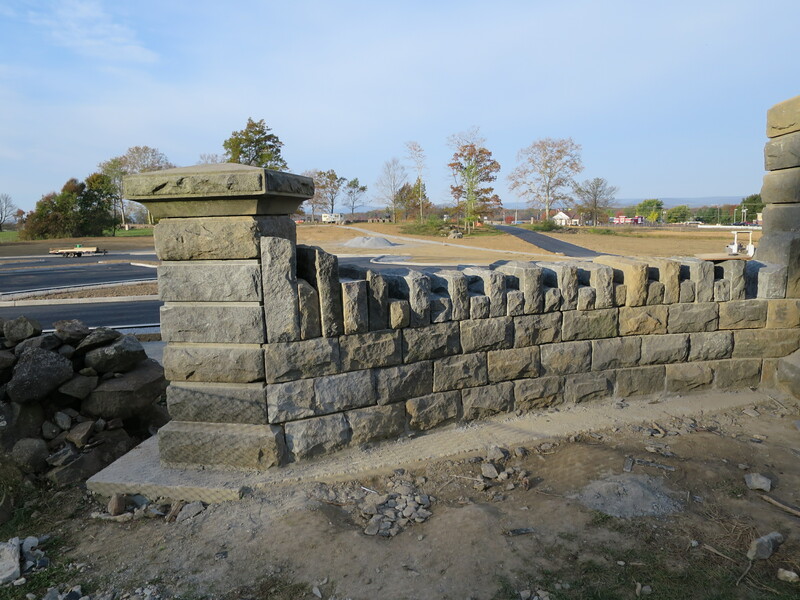 We are impressed, however, with the attention to detail and the workmanship that was shown by the National Park Service employees in recreating this structure. 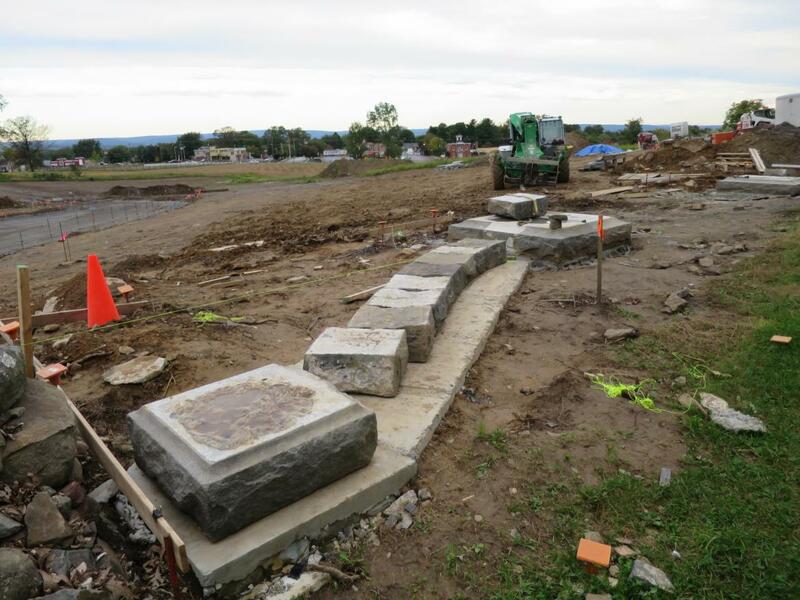 For instance, they made an effort to find the original foundations for the columns that were put here in 1923.This image was taken facing southwest at approximately 7:30 AM on Sunday, November 27, 2016. 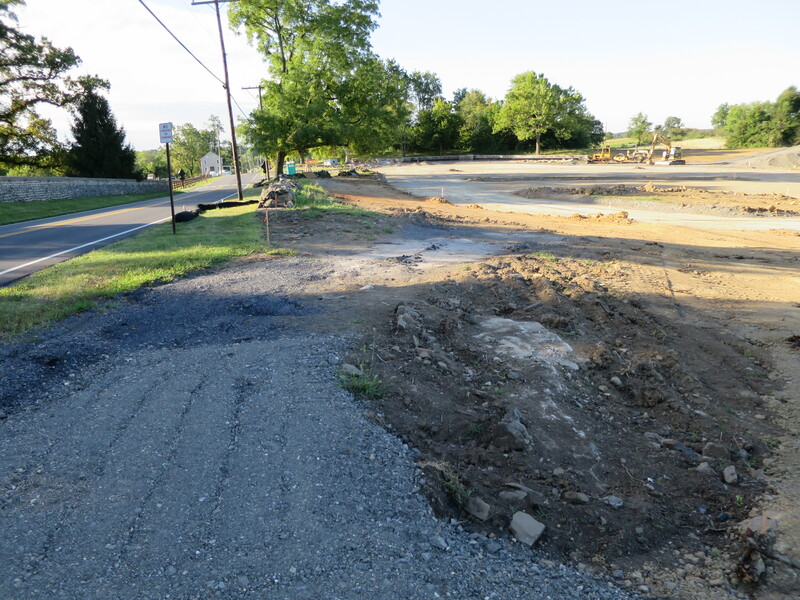 They had to locate the foundations in this area to the left and right of the old sidewalk.This view was taken facing southwest at approximately 7:00 AM on Monday, May 26, 2014. 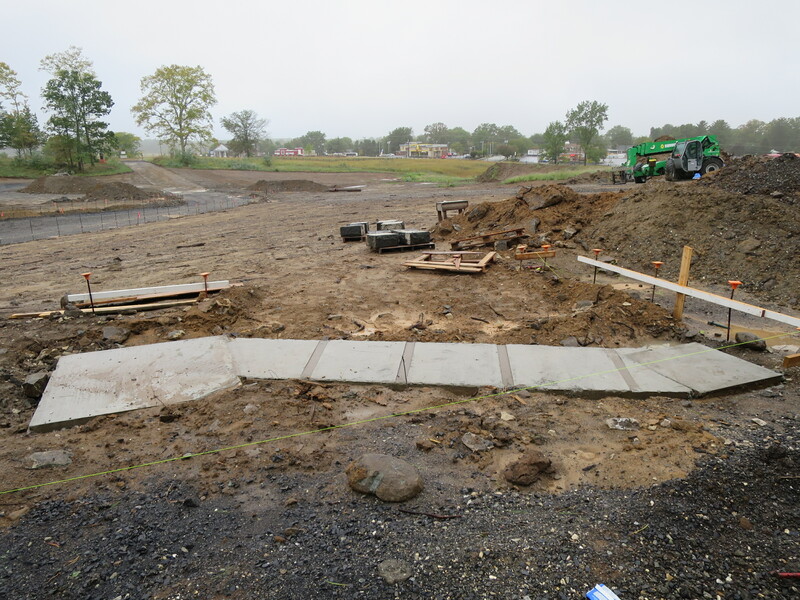 The foundation to the left/south of the sidewalk was easy to find.This view was taken facing southwest at approximately 7:00 AM on Monday, May 26, 2014. 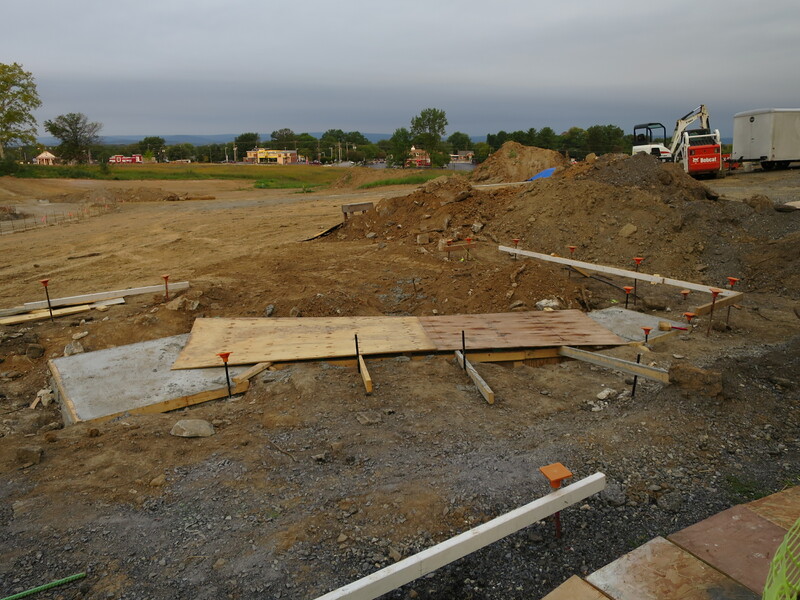 The foundation to the right/north of the sidewalk was not as easy to locate.This view was taken facing southwest at approximately 7:00 AM on Monday, May 26, 2014. 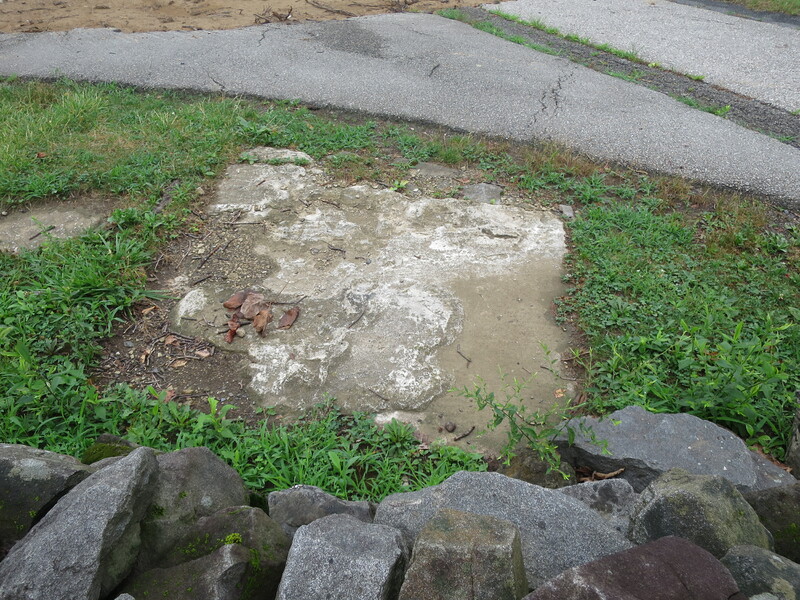 The left/south column foundation and even the foundation of the original “commemorative era” stone wall has long been visible to those who know for what they were looking. They are just to the left of the 1863/battlefield style stone wall.This view was taken facing northwest at approximately 6:30 AM on Sunday, July 31, 2016. A closer view of the left/south column foundation.This image was taken facing southwest at approximately 6:30 AM on Sunday, July 31, 2016. 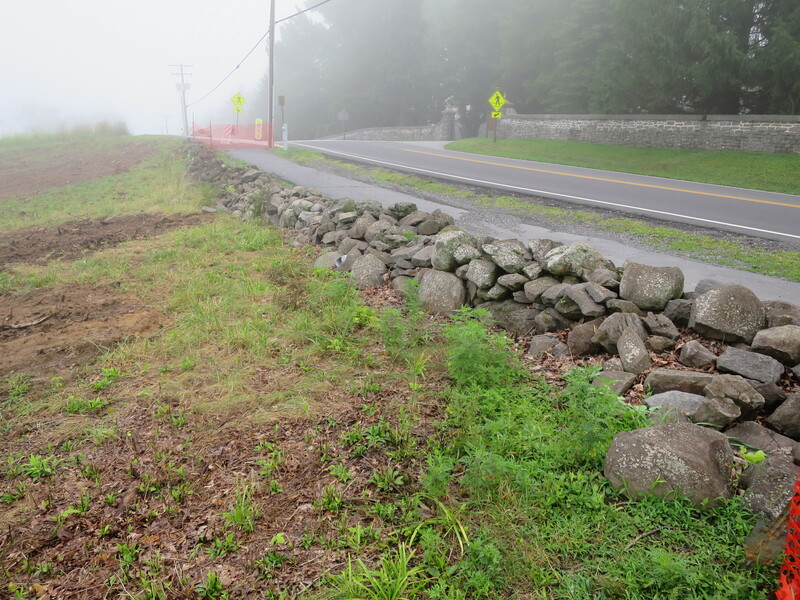 A closer view of the left/south “commemorative era” stone wall.This image was taken facing southwest at approximately 6:30 AM on Sunday, July 31, 2016. 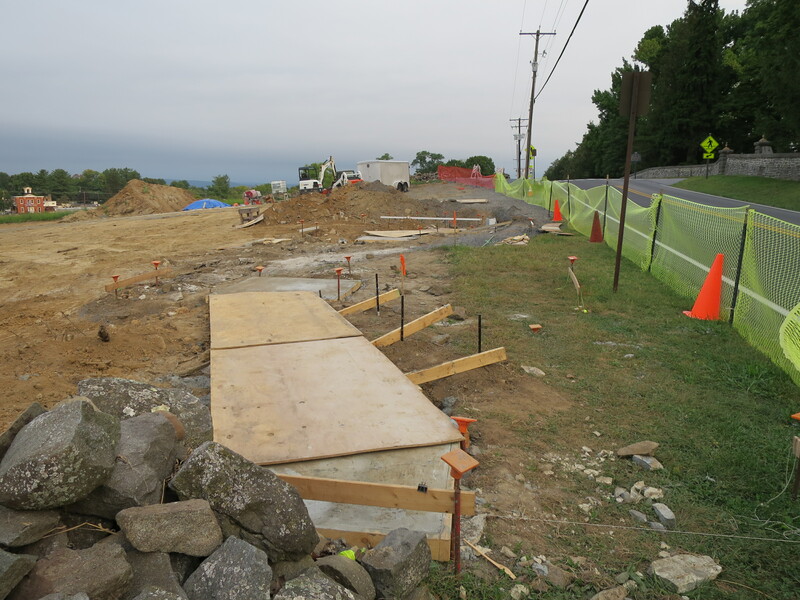 The foundation for the column on the right/north side of the sidewalk had not yet been located when we took pictures here at the end of July.This image was taken facing west at approximately 6:30 AM on Sunday, July 31, 2016. This one took a while.This image was taken facing north at approximately 6:30 AM on Sunday, July 31, 2016. 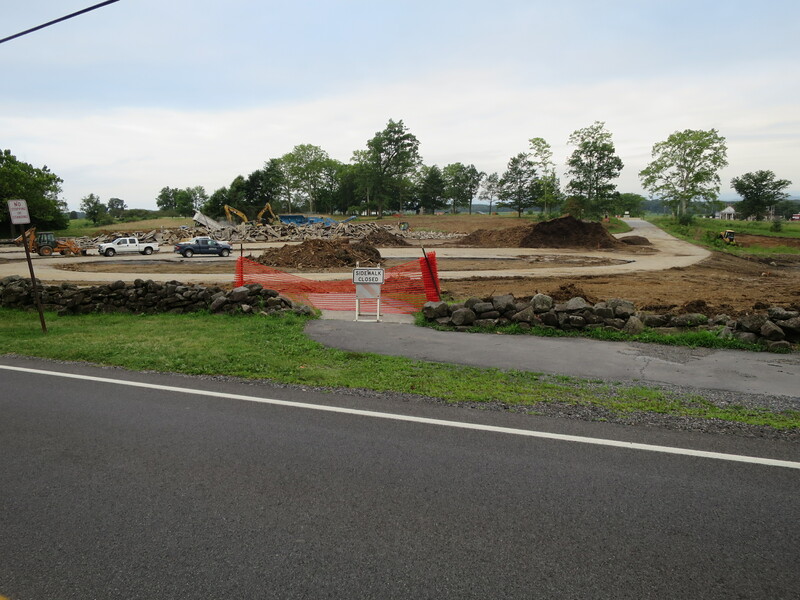 The National Park Service uncovered the column foundation and the “commemorative era” wall foundation a few days after our previous photographs.This image was taken facing south/souththwest at approximately 6:30 AM on Wednesday, August 3, 2016. 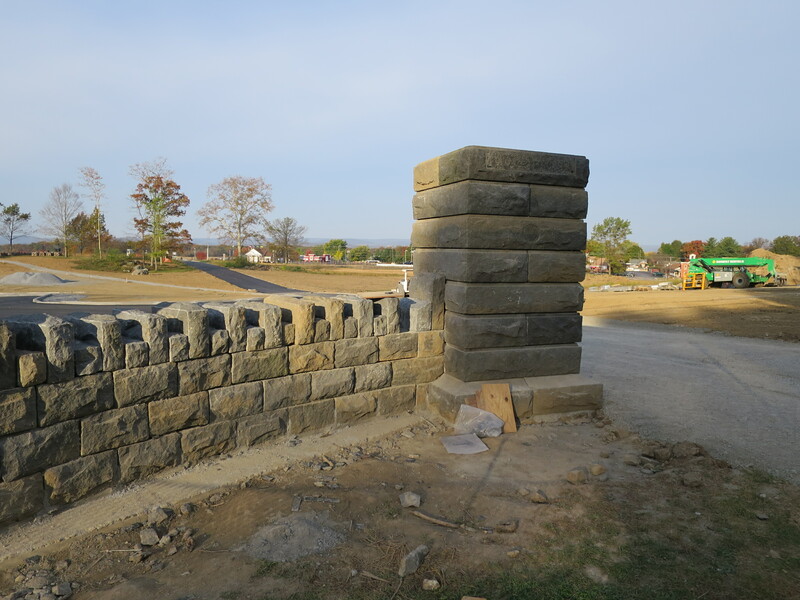 Here’s a view of the right/north foundation for the column and “commemorative era” wall after the 1863/battlefield style stone walls were removed for this project.This image was taken facing south at approximately 6:30 AM on Saturday, September 3, 2016. 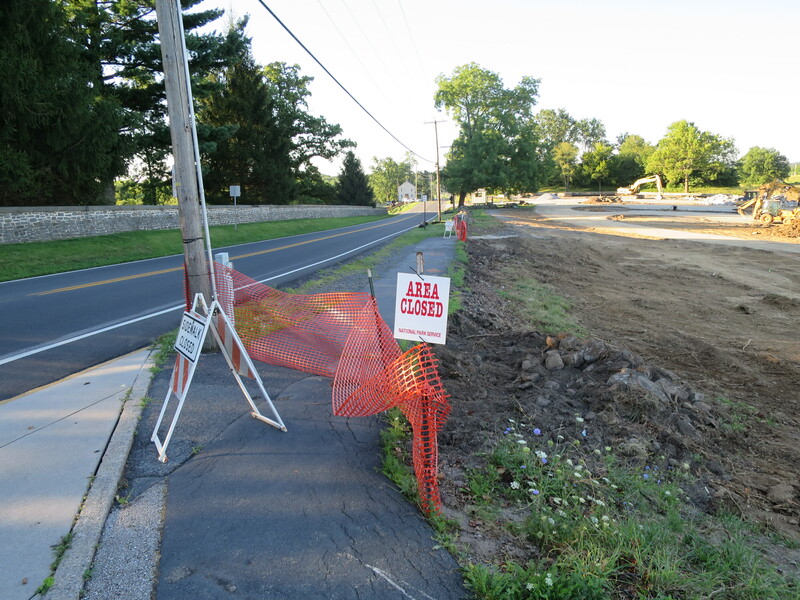 You know, the 1863/battlefield style stone walls that used to be here, such as on the right/west of the asphalt sidewalk…This image was taken facing south at approximately 6:30 AM on Wednesday, August 3, 2016. 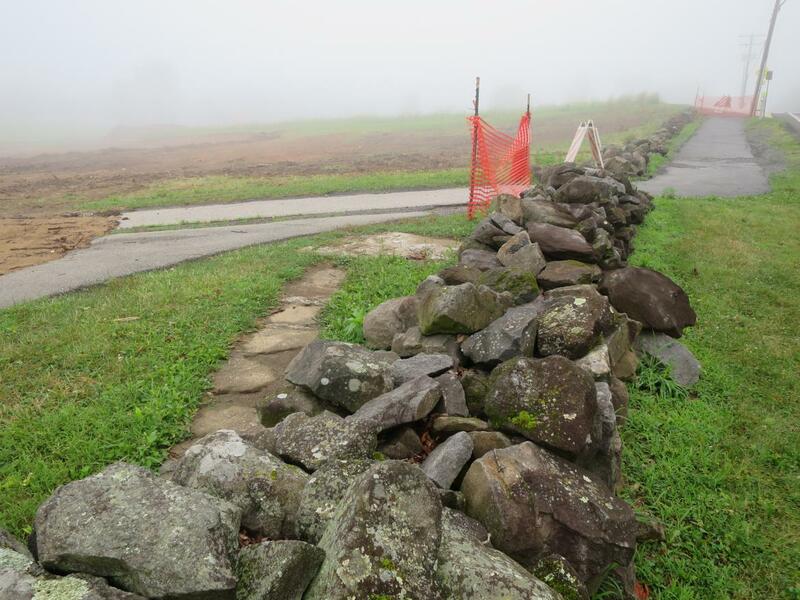 …were removed for the “commemorative era” stone walls that are inaccurate for the 1863 battlefield era.This image was taken facing south at approximately 6:30 AM on Sunday, August 7, 2016. By the end of the September, the Park Service had completed a lot of the “prep work” on the site.This image was taken facing southwest at approximately 6:30 AM on Saturday, September 24, 2016. 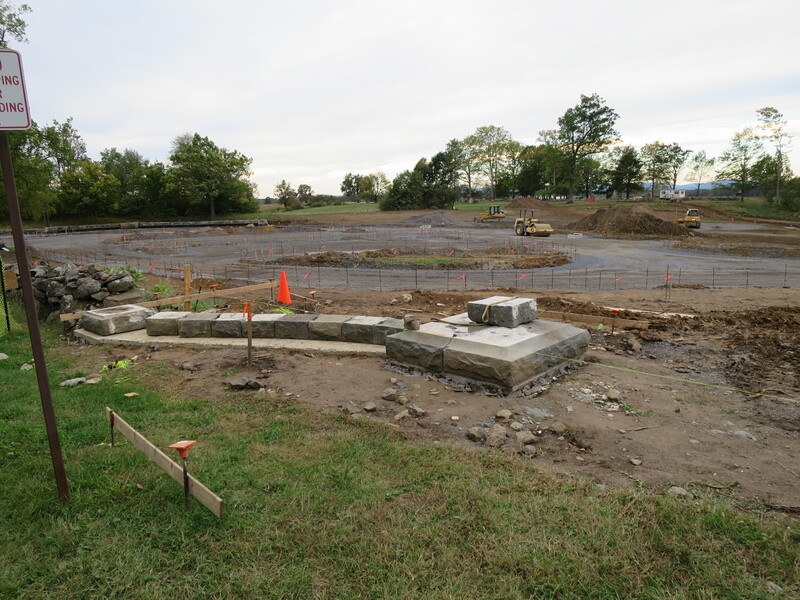 The new foundations that were poured for the column and the “commemorative era” wall are much larger than the original foundations. 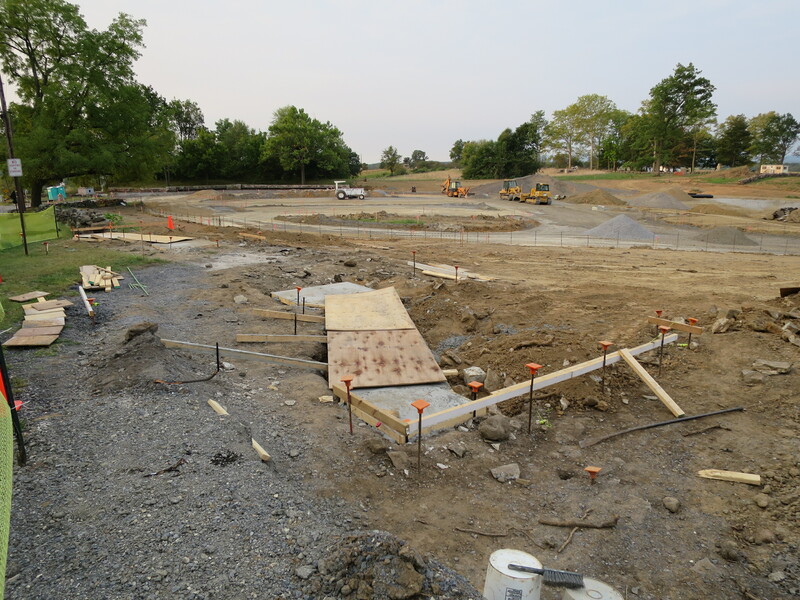 Here are the right/north foundations.This image was taken facing west at approximately 6:30 AM on Saturday, September 24, 2016. Here are the left/south foundations.This image was taken facing northwest at approximately 6:30 AM on Saturday, September 24, 2016. 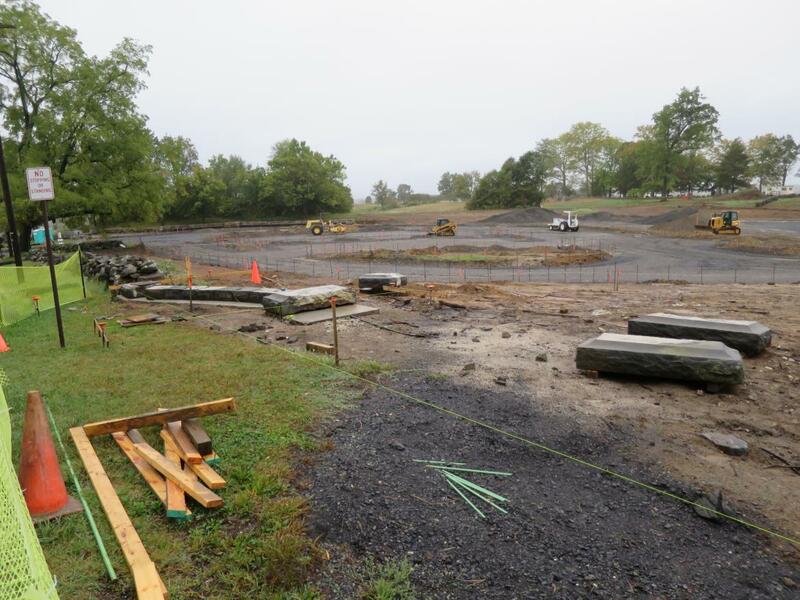 By the beginning of October, the foundations had been completely poured. 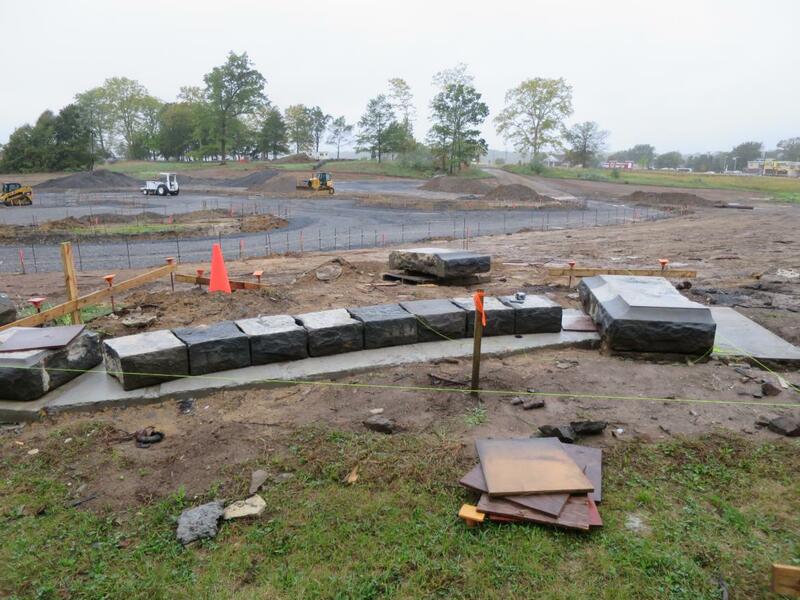 The large stones in the background would be placed on top of these foundations. 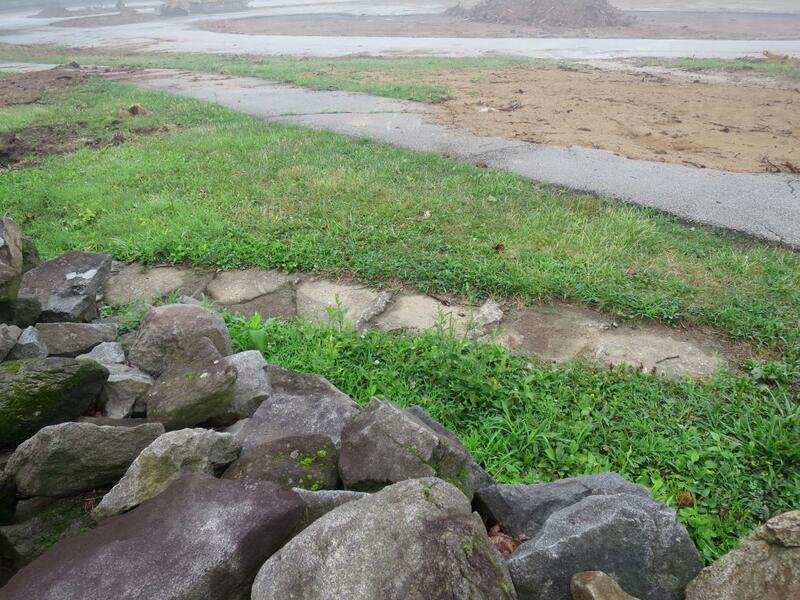 These are the right/north foundations.This image was taken facing southwest at approximately 6:45 AM on Sunday, October 2, 2016. 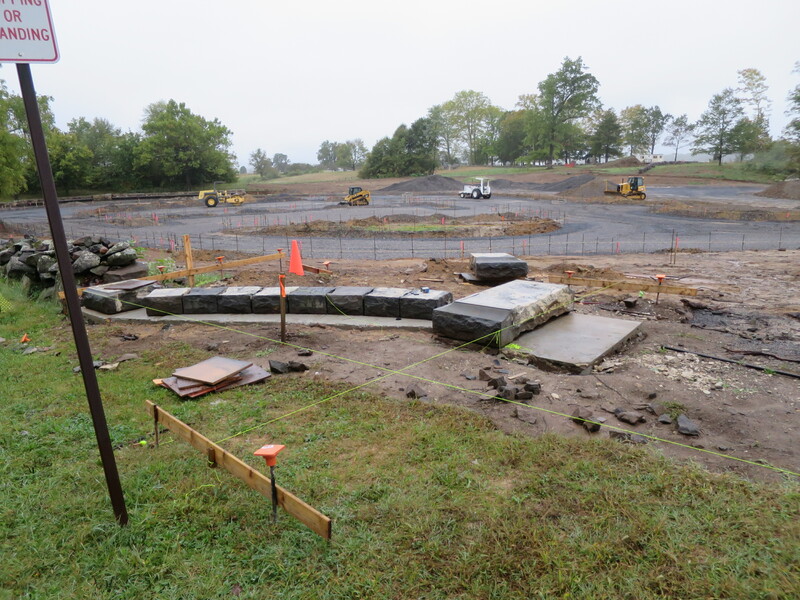 Another view of just the foundations.This image was taken facing southwest at approximately 6:45 AM on Sunday, October 2, 2016. 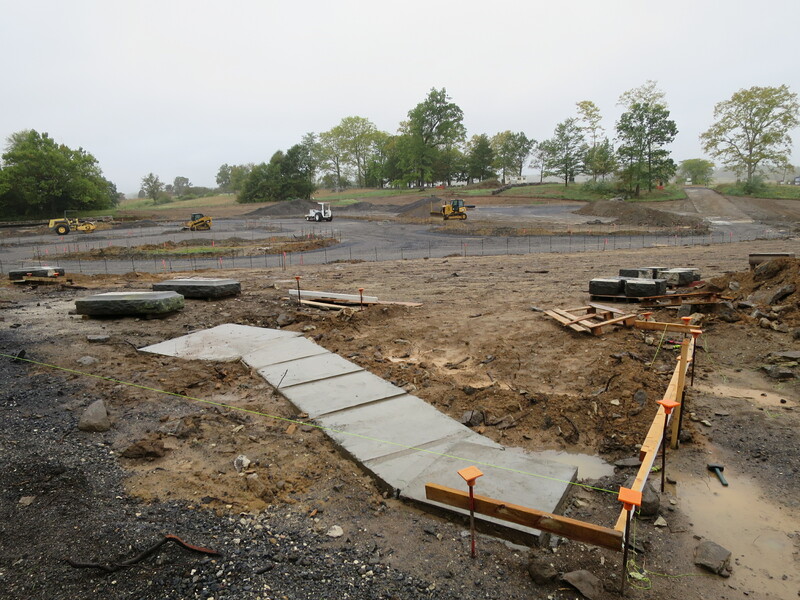 As we approached the left/south foundations, we could see that they were a little farther along.This image was taken facing souththwest at approximately 6:45 AM on Sunday, October 2, 2016. 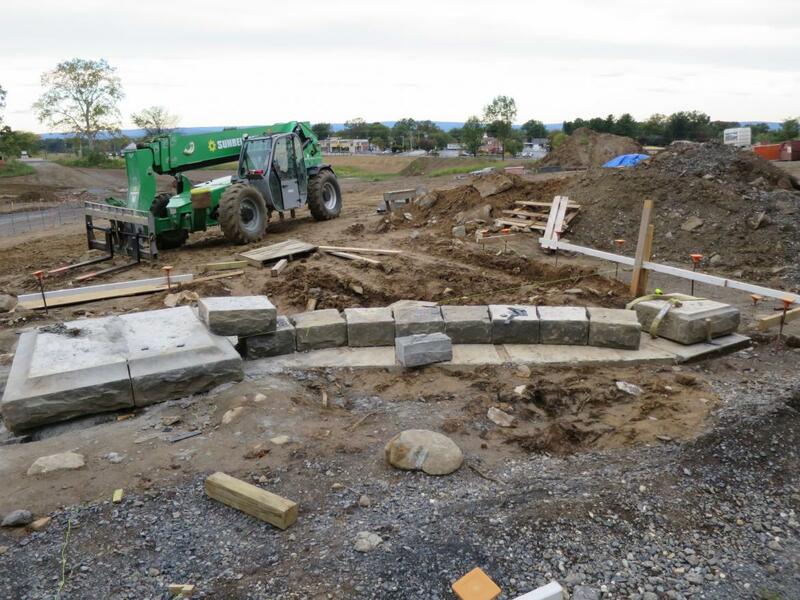 The foundations stones had almost completely been placed on the cement foundation.This image was taken facing southwest at approximately 6:45 AM on Sunday, October 2, 2016. 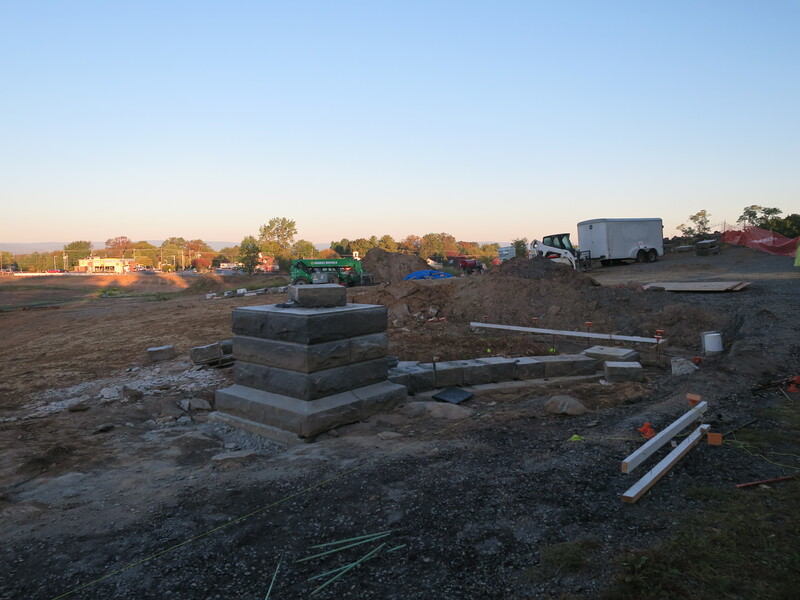 Another view of the south/left foundations.This image was taken facing southwest at approximately 6:45 AM on Sunday, October 2, 2016. 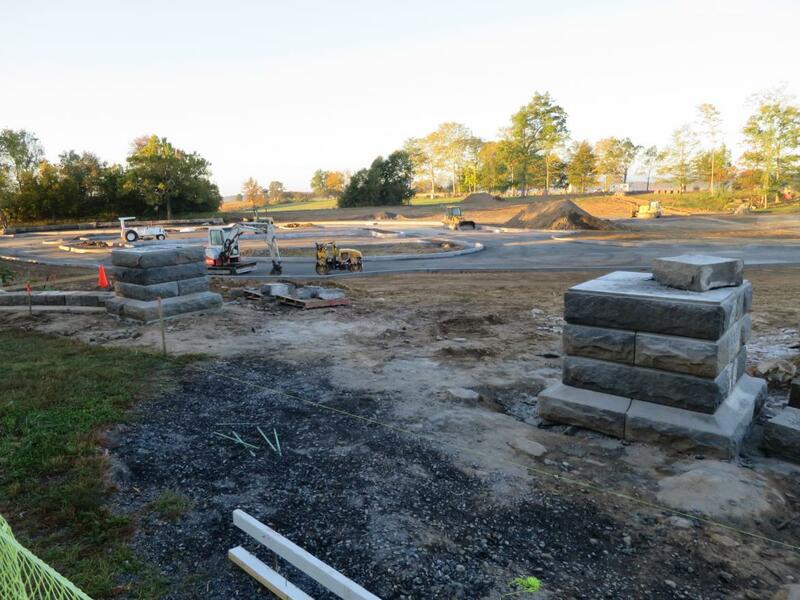 When we visited the project during the second week of October, a little more progress had been accomplished.This image was taken facing southwest at approximately 7:00 AM on Sunday, October 9, 2016. The foundation stones had been placed on the right/north section of the “commemorative era” gate.This image was taken facing west at approximately 7:00 AM on Sunday, October 9, 2016. 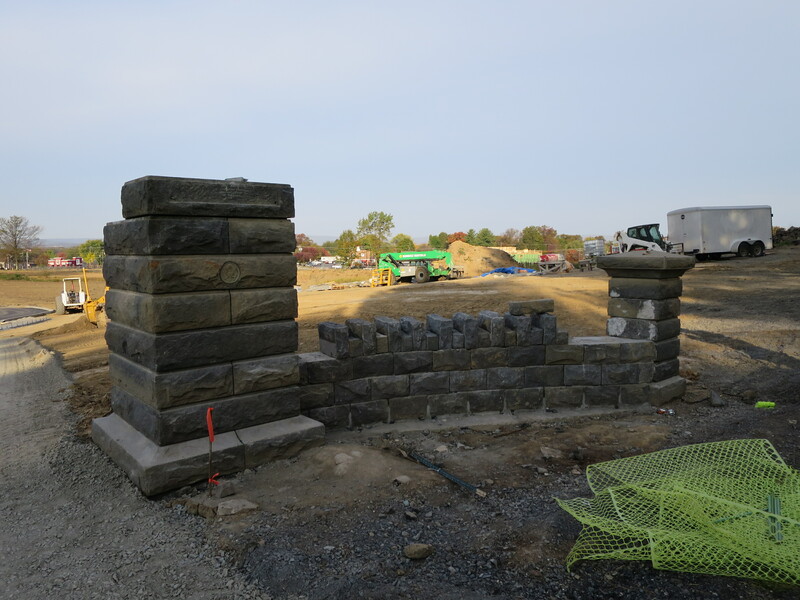 During this time there was a little less progress on the left/south section of the “commemorative era” gate.This image was taken facing southwest at approximately 7:00 AM on Sunday, October 9, 2016. 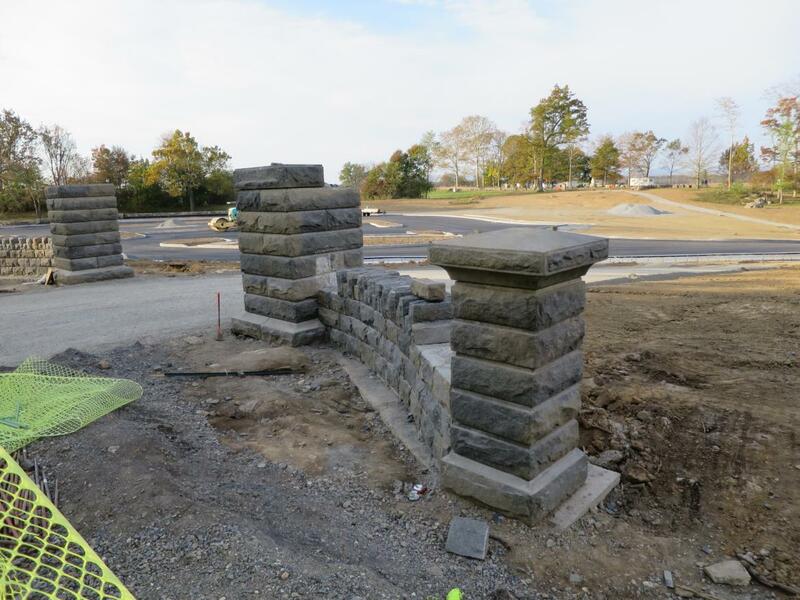 The left/south section of the “commemorative era” gate.This image was taken facing west at approximately 7:00 AM on Sunday, October 9, 2016. 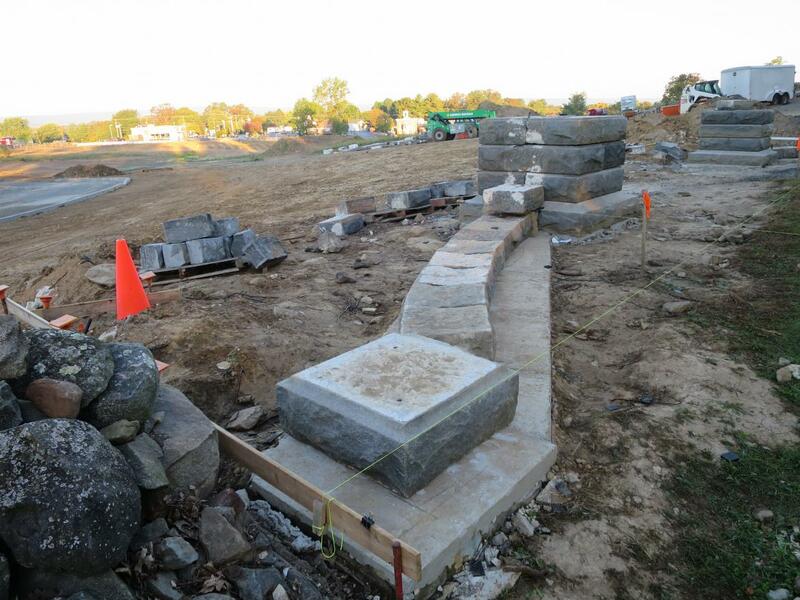 Here’s the progress achieved by the middle of October.This image was taken facing southwest at approximately 7:00 AM on Saturday, October 15, 2016. 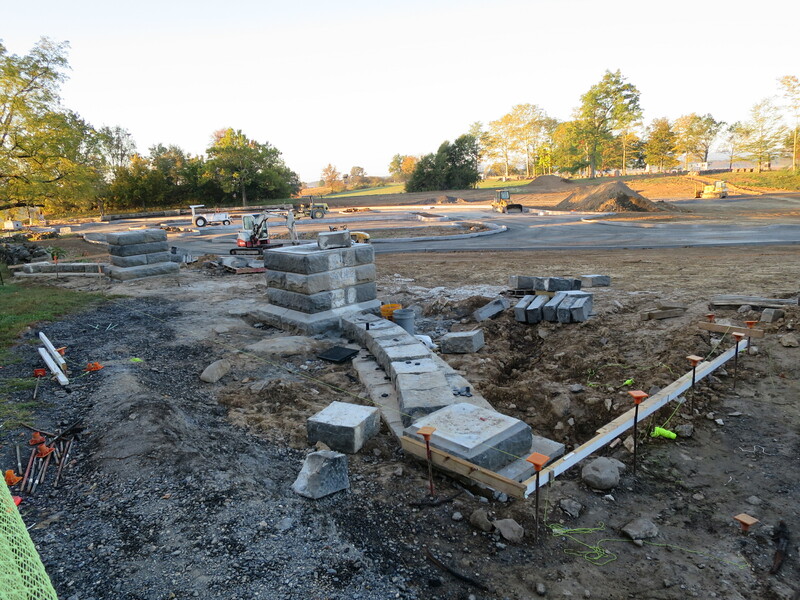 Most of the progress was made on the columns.This image was taken facing southwest at approximately 7:00 AM on Saturday, October 15, 2016. 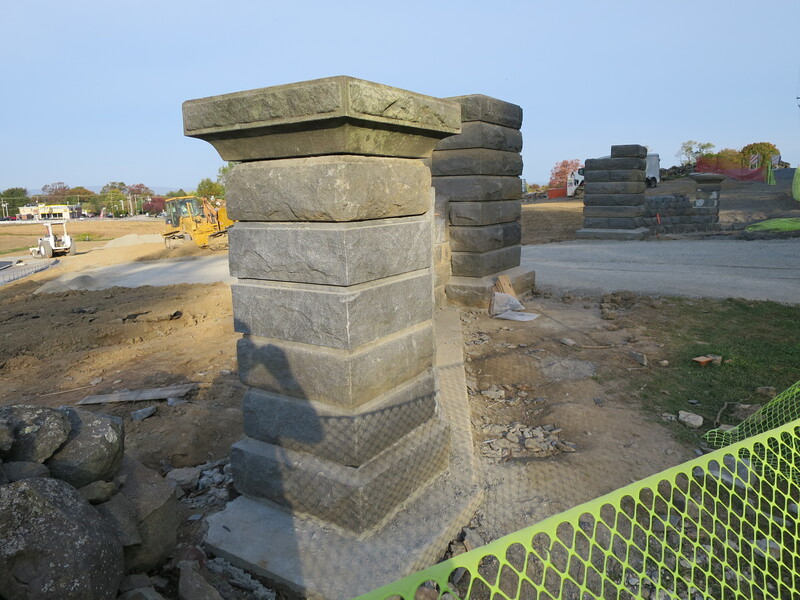 This is the right/north section of the “commemorative era” gate.This image was taken facing west at approximately 7:00 AM on Saturday, October 15, 2016. 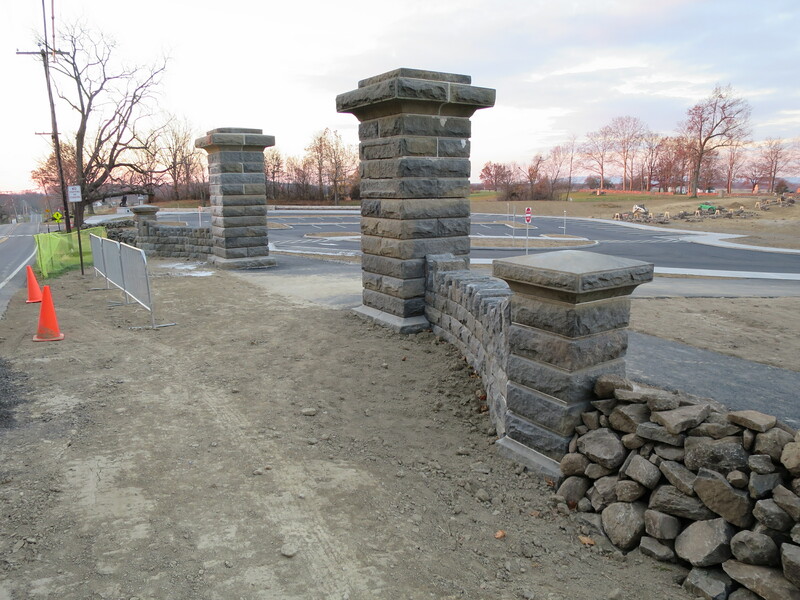 This is the left/south section of the “commemorative era” gate.This image was taken facing southwest at approximately 7:00 AM on Saturday, October 15, 2016. 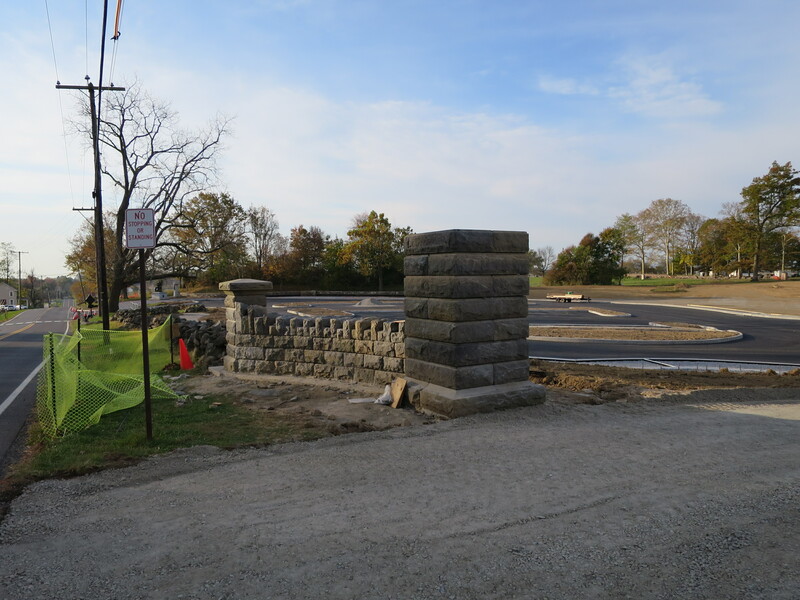 Another view of the left/south section of the “commemorative era” gate.This image was taken facing west at approximately 7:00 AM on Saturday, October 15, 2016. 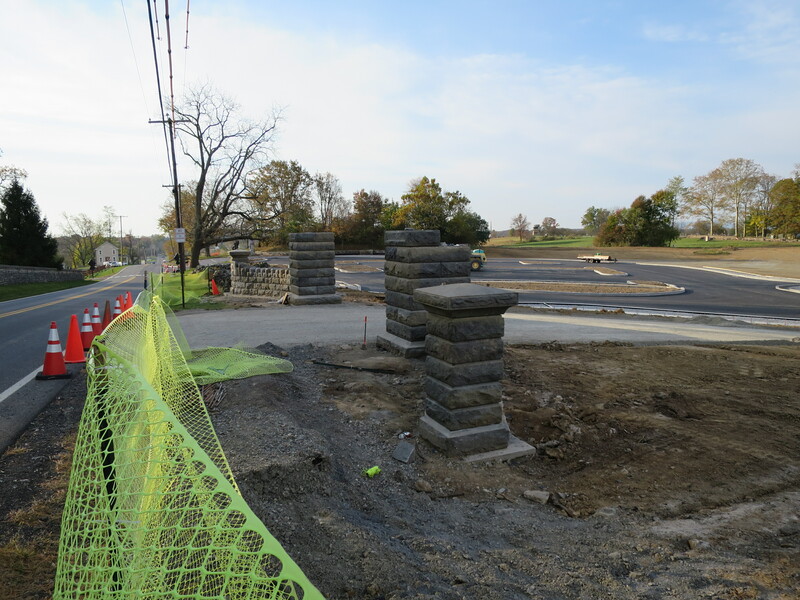 Here’s what the “commerative era” Hancock Avenue Gate looked like at the end of October.This image was taken facing south to southwest at approximately 8:00 AM on Sunday, October 30, 2016. 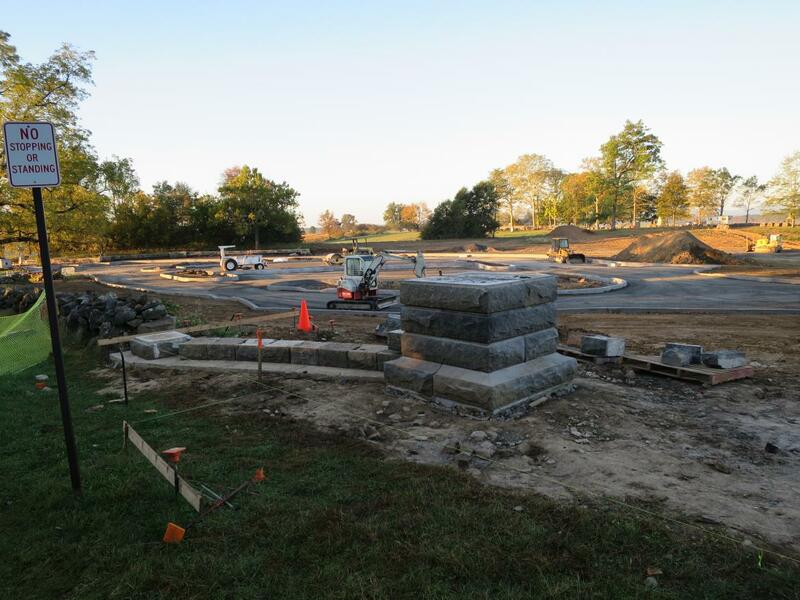 Each section now contained two columns, with the outside columns a smaller size.This image was taken facing southwest at approximately 8:00 AM on Sunday, October 30, 2016. The right/north section of the “commemorative era” Hancock Avenue Gate. 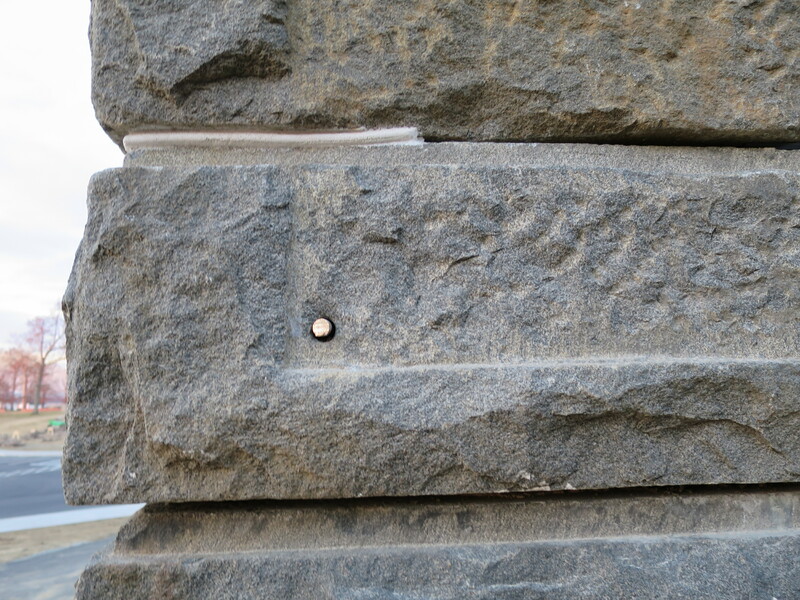 Look at the third stone from the top of the larger column.This image was taken facing west at approximately 8:00 AM on Sunday, October 30, 2016. 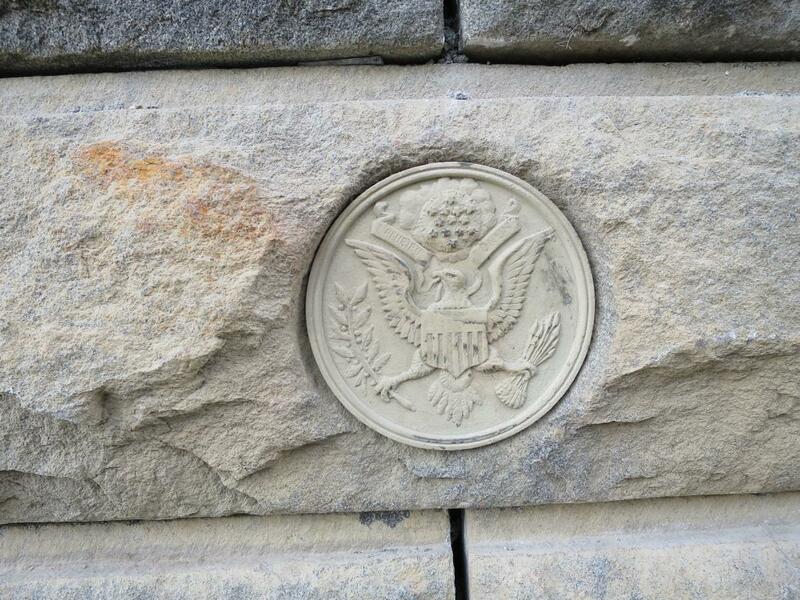 These stones on both of the larger columns contain the seal of the United States of America.This image was taken facing southwest at approximately 8:00 AM on Sunday, October 30, 2016. The left/south section of the “commemorative era” Hancock Avenue Gate.This image was taken facing southwest at approximately 8:00 AM on Sunday, October 30, 2016. We believe that this is beautiful craftsmanship.This image was taken facing southwest at approximately 8:00 AM on Sunday, October 30, 2016. 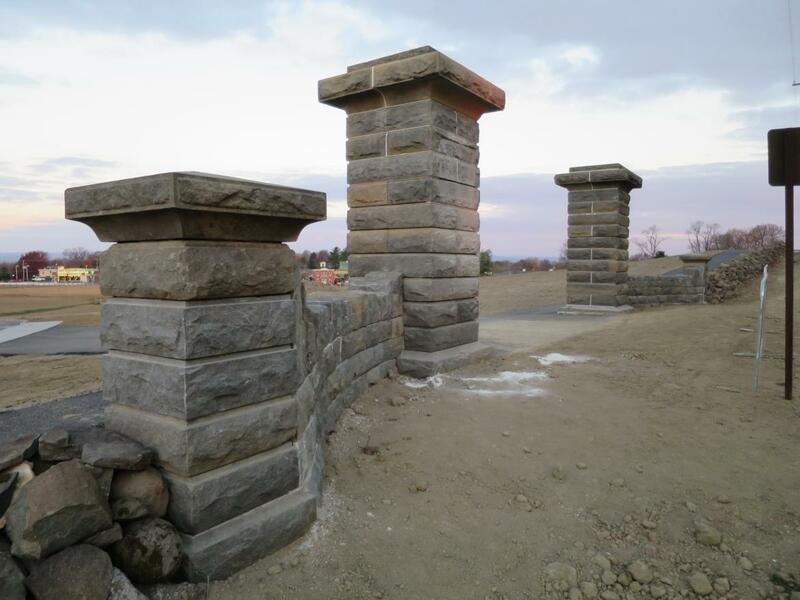 The smaller, outer columns have capstones.This image was taken facing southwest at approximately 8:00 AM on Sunday, October 30, 2016. 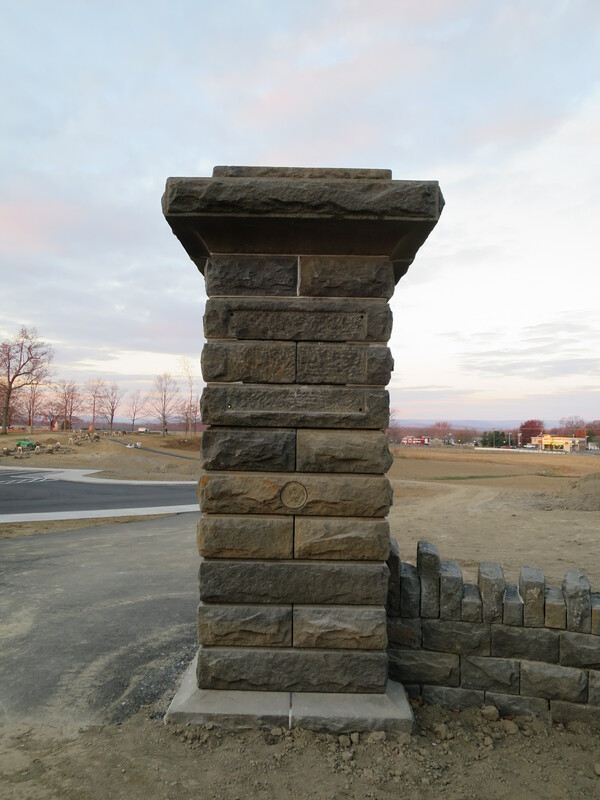 The larger column on the left/south section.This image was taken facing west at approximately 8:00 AM on Sunday, October 30, 2016. The Hancock Avenue Gate with our signature shadow, just so you can be assured that it was us taking these pictures.This image was taken facing northwest at approximately 8:00 AM on Sunday, October 30, 2016. 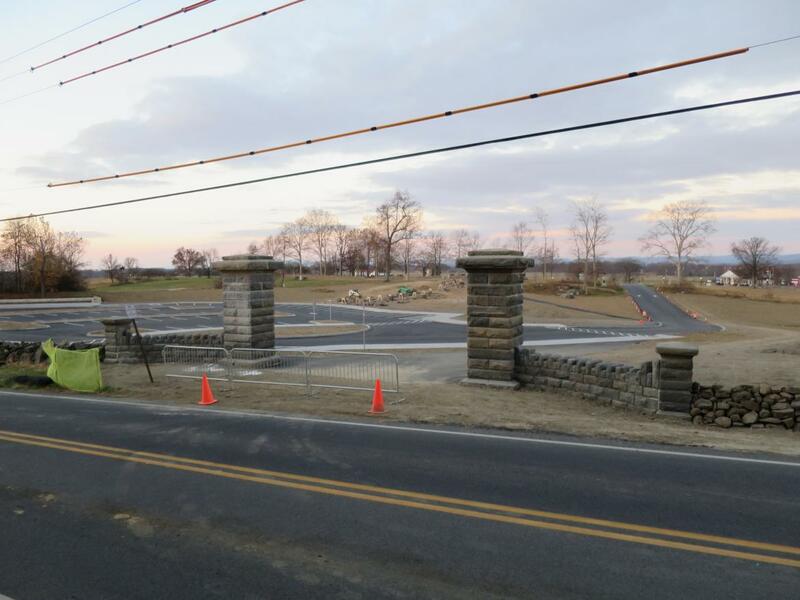 By the end of November, the gate was nearing completion.This image was taken facing southwest at approximately 7:30 AM on Sunday, November 27, 2016. 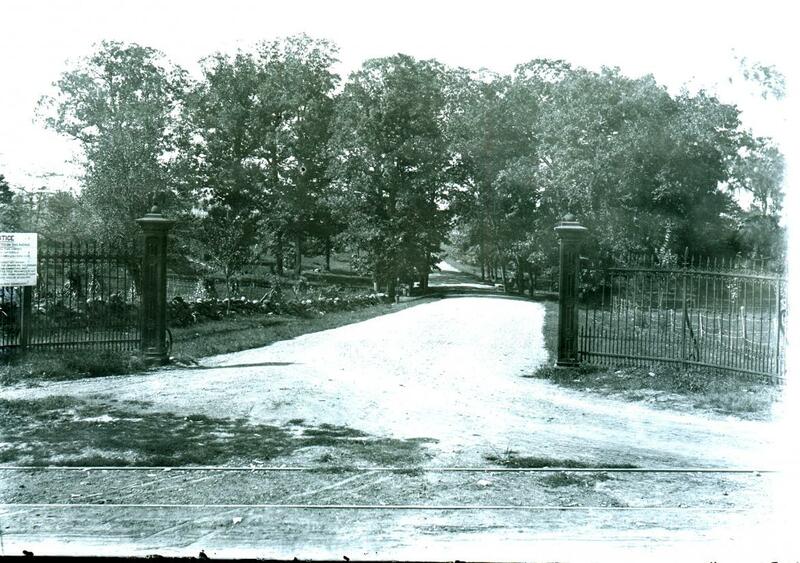 Compare the previous picture to this photograph of the completed gate. Still to be added on the small columns are the spheres/cannonballs. 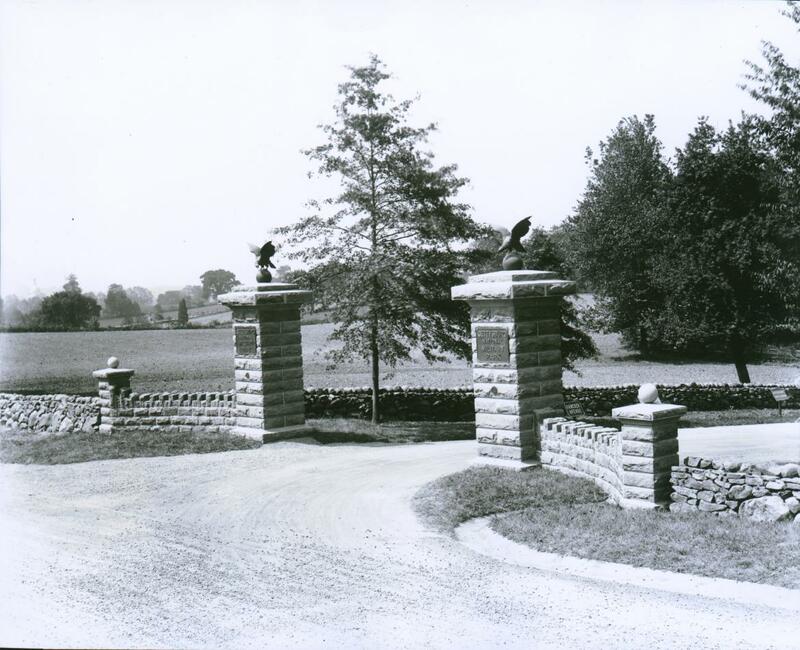 On the large columns the eagles, globes and plaques stating “Gettysburg National Military Park” have yet to be added.This view was taken facing southwest after 1923 and before 1960. 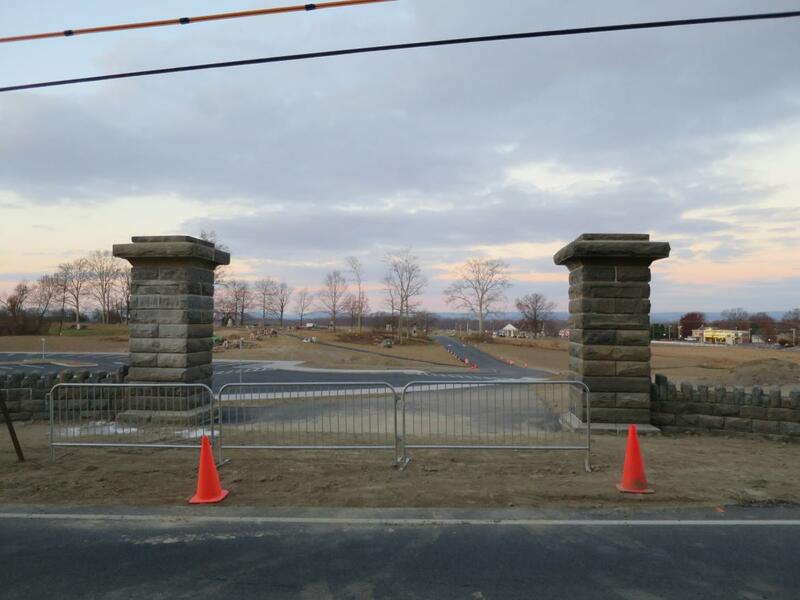 The right/north section of the “commemorative era” Hancock Avenue Gate.This image was taken facing west at approximately 7:30 AM on Sunday, November 27, 2016. 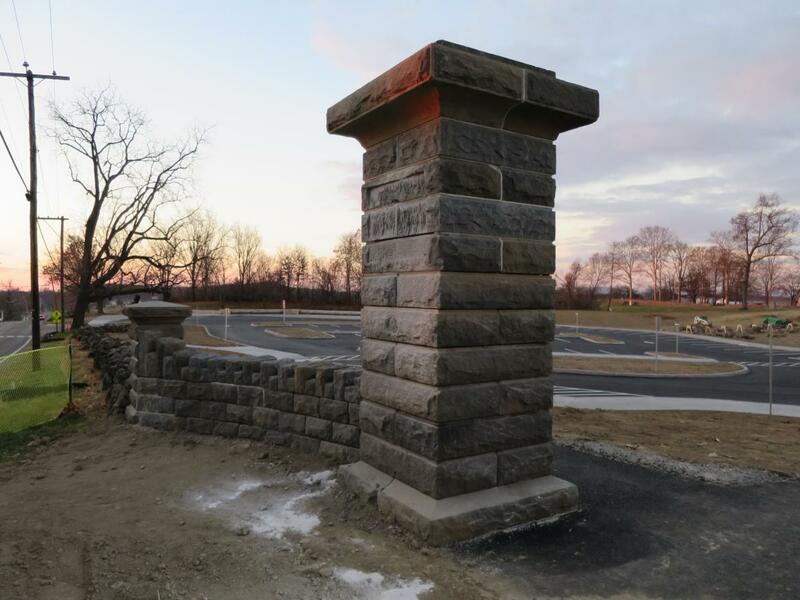 On the column look at the open space underneath the capstone.This image was taken facing southwest at approximately 7:30 AM on Sunday, November 27, 2016. Right here.This image was taken facing southwest at approximately 7:30 AM on Sunday, November 27, 2016. Here’s one of the bolts that will attach the “Gettysburg National Military Park” plaque to the column.This image was taken facing southwest at approximately 7:30 AM on Sunday, November 27, 2016. The left/south section of the structure.This image was taken facing southwest at approximately 7:30 AM on Sunday, November 27, 2016. Another view of the left/south section of the structure.This image was taken facing west at approximately 7:30 AM on Sunday, November 27, 2016. The Hancock Avenue “commemorative era” gate from the south.This image was taken facing northwest at approximately 7:30 AM on Sunday, November 27, 2016. The Hancock Avenue “commemorative era” gate from the north. We will attempt to you give you another update on the gate at a later time.This image was taken facing southwest at approximately 7:30 AM on Sunday, November 27, 2016.